Ohio State football coach Urban Meyer has been banned from contacting players and coaches while he’s under investigation. 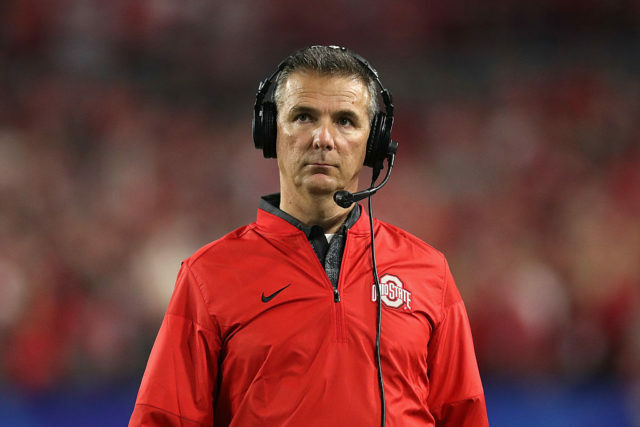 Ohio State head football coach Urban Meyer is not allowed to communicate with Buckeyes players or members of the team’s coaching staff while on administrative leave during an investigation into the handling of 2015 domestic abuse allegations against former wide receivers coach Zach Smith. On Thursday, Ohio State associate vice president for university communications Christopher Davey confirmed to Bill Landis of Cleveland.com that Meyer is also banned from campus and doesn’t have access to any “university-issued communication devices,” including his OSU email account. As for being banned from contacting players and coaches, you can read it two ways. The first way is that they just want Meyer to stay silent while he’s on administrative leave so it looks like he’s not interfering. The other way to read it is that OSU is getting nervous and is trying to push him as far from his circle as they can. I’d choose the former before the latter. OSU needs this investigation to look as legit as they can so that, when they choose to keep him, it appears they made the fairest choice possible. Keep checking back to The Smoke Room for more updates on the developing situation at Ohio State.